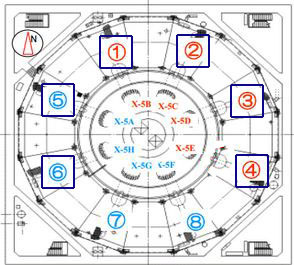 TEPCO released preliminary information from the second muon scan of unit 2 at Fukushima Daiichi. This scan finds no fuel in the reactor vessel. The scanner can detect masses of fuel 1 meter or larger. The full scan will be completed by mid-July and should further confirm any fuel findings, or lack thereof. The scans did identify the fuel in the spent fuel pool, this helps confirm that the system is working properly and that the results are accurate. The image below is the actual muon scan results with darker blue indicating areas where fuel is. The internal structures of the reactor are drawn in by TEPCO. TEPCO originally thought there was fuel remaining in the bottom head of the reactor vessel. 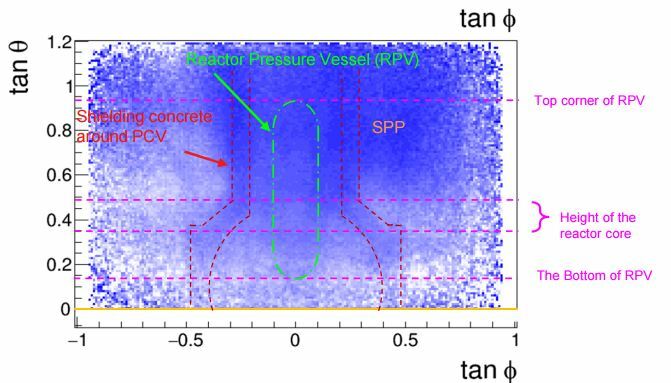 The scan clearly shows no significant amount of fuel remaining in the core region where the fuel was before the meltdown or in the bottom of the reactor vessel. The Japanese version of the handout also included some unusual images. Manual translation of the related text indicates these shadows below the reactor are from the high soil hill behind the reactor blocking proper scanning of that area. The final scan report in July may refine the imagery but it is unlikely to change the results. In possibly related news TEPCO recently admitted that the RCIC emergency cooling system at unit 2 failed on March 14, something we already reported in our Unit 2 Report. What is unusual is that they indicate they think there was also a leak involved with the system that caused a failure of cooling. Exactly what TEPCO means by this and the implications it may have for the meltdown at unit 2 is something we are investigating further.